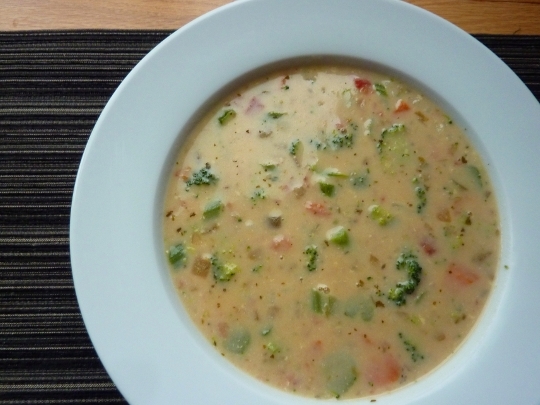 After recently reading another food blogger’s post about Homemade Broccoli and Cheese Soup, I was inspired to make myself a similar batch – being a lover of the stuff myself. 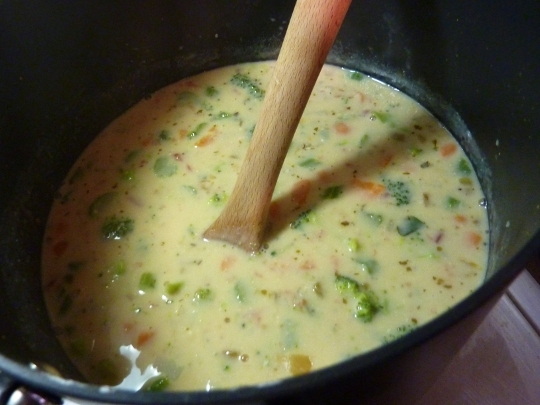 I was in the mood for some Broccoli and Cheese Soup with a bit of a kick to it, and followed the lead by selecting a lower-calorie version than say, the traditional, and found this recipe at the Taste of Home site for Southwestern Broccoli Cheese Soup. 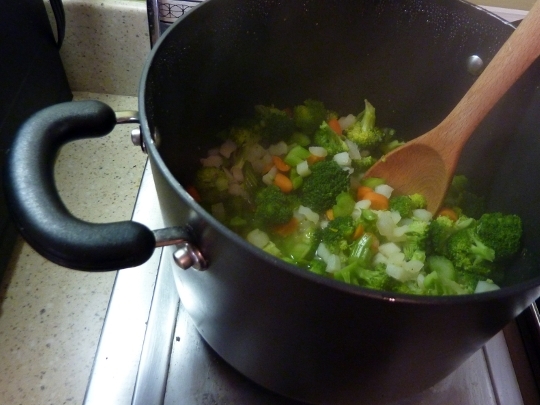 First things first, I prepped a huge bowl of veggies for the soup – VEGtastic! TONS of veggies = lots of soup volume + few calories. Load up on the veggies. 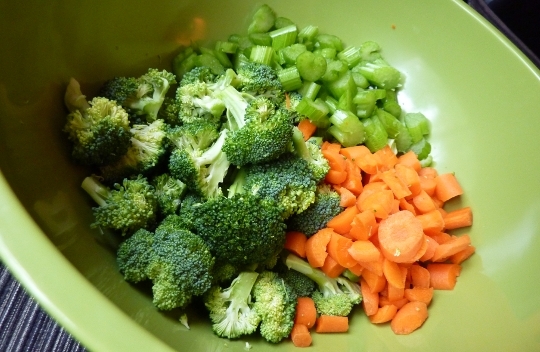 I simmered the above veggies (broccoli, carrots, celery) plus 3 cups of frozen cubed hash browns in 4 cups water + 4 tsp. bouillon, covered, until soft. I am becoming a huge fan of bouillon, especially the sodium-free version, as it delivers a punch of flavor with ZERO sodium (unlike most sodium-laden canned broths) and only around 10 calories per teaspoon. To the veggies + water + bouillon mixture, I slowly added milk that had been whisked into a few tablespoons of flour, and brought the mixture to a boil, until thickened. 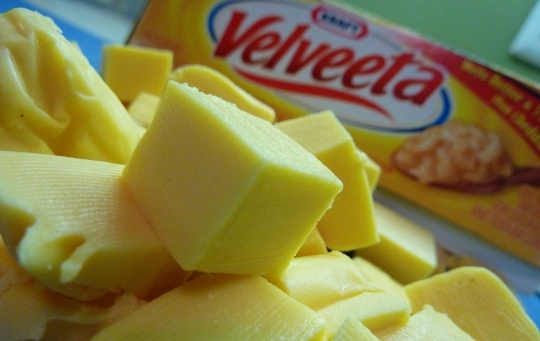 Next it was time for the cubed Velveeta to do its thanggg – melt and create cheesy deliciousness! And oh yeah, there was a generous grind of fresh black pepper in there too. You can never O.D. on pepper, in my book. Something about creamy soups and sauces + black pepper is magical to me. So, the ingredient that took this soup to a whole ‘nother level was: …SALSA! I used 1 cup of a medium chunky salsa and it totally gave the soup a great spicy KICK! Oh. Vel(vetta). Yes. I’m pretty sure I would like to bathe in a bowl of this stuff. Yeah, I’m kind of weird like that. Oh, and did I mention that 1 cup of this soup only has 143 calories. You can thank me later. I also served this with some Take & Bake Paesano cheese bread from Meijer, which was pretty legit. Orrrr… if you’re feeling extra ambitious, you could also make homemade beer bread, like this blogger. ♪♫ Currently listening to: Hear Me Now – Framing Hanley. I’ll thank you now!! What a great recipe! I can’t wait to try it! “Thanks” will be accepted at all times, actually, haha. 🙂 Yes, it’s a tasty recipe! Oh my word! I have been dying for this recipe! In college they use to serve this soup all the time, and I miss it like crazy! I will definitely be making this soon! Oh I am so glad you made it…and pimped it out with extra veggies!! Looks so good! Pingback: Beer Bread « Meg.Goes.Nom.Nom.